It is a sad truth to me that in the line of my work I am often witness to the saddest times in people’s lives. I often hear about the greatest of travesties which occur to individuals and it makes me realise what pain is inflicted on us at times and the suffering we have to go through in order to cope with grief. However, isn’t it just these precise times which make us stronger? This account revolves around a very close married couple. Their story brought back to me some advice that I once received from a man I used to work with. He was not a spiritualist, and in fact at the time (I did not even particularly like him very much!) but what he said stayed with me for a very long time. Kath came to see me at my home one wintry afternoon. She was a small woman, dressed sombrely, and although she only looked to be in her mid fifties, the air of resignation which she carried with her made her look older. There was a deep tiredness in her eyes and I felt an overwhelming sense of sadness around her as she stood at the door. I had been recommended to her by a friend of hers and I got the impression that she wasn’t altogether sure about coming to see me as she looked nervously into the room. The second she crossed the threshold, I immediately had contact with a man called Jim. It was as if he had been waiting in my front room ready for her arrival. I watched Kath as she sat down and knew that this Jim would be significant to her. I gave her a few minutes to settle down and brought her the glass of water she asked for. After she calmed herself a little, I told her that Jim had made contact. Kath slumped back a little into the chair and her face was filled with emotion. I asked her if she was alright and reminded her to take a sip from her glass. Her hand shook a little as she brought it to her lips but she told me in a steady voice to go on. As the reading went on, I was able to recount some instances and times which she acknowledged were memorable to her. She visibly relaxed; she was more sure in the knowledge that this indeed was contact with her significant other. The whole time, I was inundated by clear visions in my mind of a beach, sand dunes and the sea; the low tide a long way off into the distance. A lone tear rolled down her cheek as I told her. Kath confirmed that indeed this was where they had spent their last moments together. Kath and Jim had decided one morning to take a trip to Southport a seaside town near Liverpool and to walk amongst the sand dunes as they had done many times before. They parked quite close to the beach and started to unpack the things they had brought with them: a folding table and two chairs, some of Jim’s favourite sandwiches as always neatly packed in aluminium foil and a flask of tea. Some horses were being exercised nearby and at first, they both sat down on the edge of the sand, eating their picnic and watching them. Jim remarked on their movement and grace and wandered over to stroke one of them. Later on, with their picnic finished, they reached into the car and grabbing their matching jackets (Kath managed a little smile as she explained they had been Jim’s idea) started their usual walk to the funfair and back. However, it wasn’t long before Jim began to breathe very deeply and immediately Kath was concerned. He tried to fob her off by telling her that it was because he wanted to fill his lungs with the wonderful sea air, but she wasn’t fooled and told him to stop walking. The deep breathing continued and Jim began to look a little grey. After a good five minutes of this, Kath insisted that Jim should sit down and rest. Her heart began to quicken as she realised that not only was his breathing excessively laboured but that by this time a cold sweat had appeared all over his brow. Suddenly, she felt her own breathing shallow. With a new urgency, she spotted steps running alongside the sand dunes that led back to the car park and started to make for them. It wasn’t to be. Suddenly, Jim slumped to the ground and try as she might, could no longer answer her call. Kath, her heart beating in her throat, ran towards a passer-by, who was luckily carrying a mobile phone, and a desperate call was made for an ambulance. Panic-stricken, Kath ran back to where Jim was lying motionless at the base of the steps and she threw her arms around him. As soon as the ambulance arrived, Jim was rushed to the local hospital but sadly, passed away before they made it. He had suffered a massive coronary and, having died almost instantly, Kath was later consoled that he could not have suffered. At this point, sat in front of me, she broke into tears. I felt a great deal of love from the spirit world but the most remarkable part of the reading was when, in a clairvoyant vision, I saw that with what looked to be a stick, Jim started to write in the sand the words, “I love you”. With a mixture of sadness and peace, and a small smile on her face, Kath explained that whenever they had visited a beach, the old romantic Jim would always write those words in the sand. Kath looked absent-mindedly out of the window and into the world outside. She said that she had recently heard a song on the radio, “Love Letters in the Sand” and that it had reminded her strongly of Jim and of their life together. She continued to confess how lonely she felt without the man she had lived with for over twenty five years. She was so used to him being by her side, she said that she still caught herself looking round and expecting to see him. Jim had been her best friend. Everything around her brought back memories of the past, and of Jim. She loved him so much that in every waking moment she longed to be with him. But for the first time, she said, she had felt him with her. Kath took a few sips of water from her glass and, sighing deeply, said that she felt better knowing that Jim was safe and that he was still very close to her. Can you imagine her devastation? A devoted couple who had been together for over twenty five years, and looking forward to sharing a long and happy retirement together, are suddenly pulled apart, their rosy future wrenched from their grasp. How would you cope if suddenly one day, your life, as Kath’s was, is turned completely upside down? After Kath had left the house I had a spare half hour until my next appointment was due to arrive. Kath, and her story, had deeply affected me. I made myself a cup of coffee and sat in the living room thinking about Kath and Jim. Their love had been so strong that it had survived the death of the earthly body and passed over into the spirit world. With a slight envy, I wondered if my relationship with my wife Christine would still be as strong in twenty five years and I thought about how difficult it is these days to make a relationship last so long. Have we been conditioned to accept the fact that there is no value in lasting commitments? It had been some years before meeting Kath that I had endured my own period of great trauma. You may already know about the loss of my mother and brother in the same week. Their deaths were both unexpected and totally unconnected but this did not make them any easier to bear. I was going through a shattering divorce myself (so much for lasting commitments) and, unable to bear the stress anymore, I lost my job in a small clothing factory as I suffered a breakdown. It’s funny how when you most need routine and normality in your life, it is cruelly taken from you. This was, I have to say, the darkest period of my life. I was very sad about my brother but my mother’s loss was tremendous to me and I was grieving her passing terribly. Work colleagues and close friends tried to help me to pick up the pieces of my life and to carry on but it was like an uphill struggle that tugged at my heart. They gave me encouragement and advice but I was so deeply entrenched in my grief that none of it made much difference to my feelings. I couldn’t see any end to the pain and thought I might as well be dead. I’ll be honest with you: there just didn’t seem to be much point in carrying on. But then I found solace in the most unexpected place. A colleague who I had had very little contact with thought that he would put in his tuppence worth and begrudgingly I listened. Suddenly, what this man said to me struck a chord, and it was instrumental in helping me to start regaining my balance and my senses. He simply came up to me one day and said, “Nothing is forever”. I realised with clarity that he was right: all things have to change eventually whether they be for good or bad. Knowing this has made a huge difference to my life. Since my own period of sadness, I have grown and now realise that what I went through enriched my life. I can now empathise with the folk who come to see me and who are going through similar experiences. With my knowledge and belief in Spiritualism and the proof of the continuation of life after death which I have been privy to, my viewpoint and perception of the truth has changed. As a Spiritualist I would now say to someone who is in dire straits or grieving, that there is a reason for everything that happens although we may not be able to see the reasoning behind it at the time. I now realise that there is one constant thing in the universe that is everlasting and cannot be destroyed even by death. 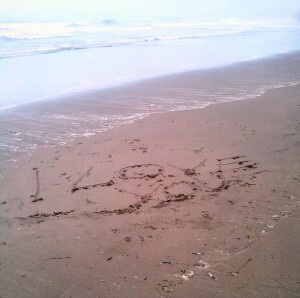 Love cannot be washed away by the tides of time. Love lives on in our minds and in our hearts, long after we have passed in the spirit world. Love unites all.